From the modernism of the 1930s to the youth culture of the ’80s, George McNeil’s art was always individualistic, passionate, even Romantic. 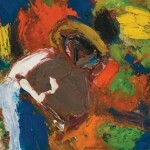 Born in 1908, he was four years younger than de Kooning and four years older than Pollock. He belonged to their world, and when the dealer Charles Egan began to exhibit work by the painters of that generation, McNeil was included. His shows received respectful notice, deservedly so. A powerfully inventive artist throughout his career—McNeil died in 1995, having worked and exhibited until the end—he is the subject of an extensive critical bibliography. Yet he was always to be found on the peripheries of all the New York School maps, the ones with Pollock at the center as well as those that give pride of place to de Kooning or Rothko. It’s not easy to say why, given the strength and sheer quantity of McNeil’s work. It may have something to do with the unreserved passion of his commitment, not only to the art of painting but to the idea of individuality that has driven ambitious painters since the Romantic era. It’s possible, in other words, that McNeil was always too much the self-sufficient individual. Born in Brooklyn, N.Y., he was the sort of child who drew for the fun of it. At Thomas Jefferson High School, he took his first art classes and found confirmation for his early sense that there was what he once called a “cultural” world beyond the “workaday” life of his family and neighbors. Encouraged by one of his teachers, he fell “head over heels” for art. Joining a Saturday-morning group at the Brooklyn Museum, he studied anatomy. At the age of 15, had his first exposure to the works of Pablo Picasso and other modernists, thanks to the Société Anonyme. Founded in 1920 by Marcel Duchamp, Man Ray, and Katherine Dreier, the Société sponsored lectures and exhibitions and, during its short life, acquired a small but impressive collection of paintings. At Dreier’s suggestion, these went on loan to the Brooklyn Museum, giving the young McNeil early exposure to the European modernism against which he and his future colleagues would react with such significant results. A scholarship took him to Pratt Institute, where he felt out of place. Pratt trained designers. McNeil wanted to be an artist, so he set out on an educational odyssey that brought him into contact with just about every notable figure in the backstory that has acquired the ring of the New York School’s origin myth. At the Art Students League, on 57th Street, he studied with Jan Matulka, a Czech-born painter who “represented,” according to McNeil, “the very best that you could get in terms of modern art education in New York City.” Painting in a style somewhere between Cubism and Futurism, Matulka was one of a handful of European artists who maintained into the 1920s the avant-garde energies unleashed in New York by the Armory Show of 1913. Another of these figures—crucial then but nearly forgotten now—was Vaclav Vytlacil, also from Czechoslovakia, who gave a series of lectures at the League in 1928 and ’29 that McNeil remembered as revelatory nearly four decades later. Earlier in the decade he had drawn from casts of ancient statues in the galleries of the Metropolitan Museum. He had made an intensive study, on his own, of the way Paul Cézanne composed his paintings. Yet it was Vytlacil, the practitioner of a painterly sort of Cubism, who gave McNeil the clearest vision of “structure” in modern art. It’s doubtful that he said anything the young artist hadn’t heard before or figured out for himself. McNeil was fully primed for Vytlacil’s message and so, as he sat in the auditorium at the Art Students League, all that he had come to believe solidified into certainty. The irony is that McNeil arrived at a style of his own by rejecting the Cubist scaffolding that provided structure to so many modernist paintings of the first half of the 20th century. In 1932 McNeil studied with Hans Hofmann at the League and, later, in the private classes Hofmann conducted in downtown Manhattan. He became a member of the Abstract Artists of America, a group formed to give a sense of solidarity to New Yorkers who were painting in modernist styles and receiving no attention from Museum of Modern Art. They were ignored, as well, by the few galleries who showed work by Picasso, Matisse, and other Parisian avant-gardists. The AAA community was bolstered when the WPA (the Works Progress Administration) began enrolling artists and providing them with monthly stipends. McNeil joined the mural wing of the program in 1935 and worked on a large design for the interior of a housing project in the Williamsburg section of Brooklyn. It was never used, which was fitting in a way. By then McNeil was working in a painterly, expressionist style, which he exchanged for Mondrian-like geometry when he assumed the role of a muralist addressing an anonymous public. McNeil’s assumption of an uncongenial style for a WPA project makes it tempting to say that, on his own, he was a private, not a public, artist. Or a personal one, whose paintings propose an intense, one-to-one exchange with a single, thoroughly engaged viewer. On the WPA, McNeil became friends with Burgoyne Diller, the geometric painter who headed the mural division. Other friends included de Kooning, Giorgio Cavallon, David Smith, Irene Rice Pereira, George Byron Browne, and Mark Rothko—all equals in those years of hard scrambling and persistent neglect, though of course a few of them emerged later as historical monuments. This difficult but exciting time came to an end, for McNeil, in 1941, when he enrolled in Columbia Teachers College. Tired of what he called the “haphazard” life of an avant-garde painter in New York, he wanted to acquire the means to make a steady living. Two years later, he joined the Navy. After three years of service, he took a teaching job at the University of Wyoming. By 1948 he came back east to become the head of the Evening Art School at Pratt Institute, which had expanded its program to include fine art as well as design. And much else had changed. McNeil was especially impressed by Pollock’s reinvention of painting. By 1950, the year of his first show at Egan, he had begun, like Pollock, to begin with a blank canvas unrolled on the studio. Unlike Pollock, he continued to apply paint with a brush, working from all four sides of the canvas with an eye for what he called—in an echo of the modernist doctrines of the pre-War decades—“plastic expression.” For McNeil to be satisfied, a painting had to work pictorially, as sheer form. 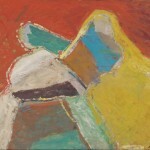 And his abstract paintings from this period often do. He can be a dauntingly complex composer. At the same time, he is relentlessly direct. There are none of the ironies in his touch that one sees in de Kooning’s brushwork—those recollections of academic training that he allows to become visible, only to hold them up to question. And McNeil never cultivated that grandly glum and sooty New York palette that one sees in the paintings of de Kooning, Pollock, and Robert Motherwell, and of course in the sweepingly calligraphic works of Franz Kline. Though McNeil never banished blacks and browns, his colors tended throughout his career toward the high-keyed and sometimes even cheerful. 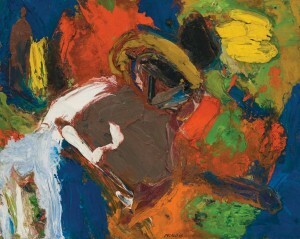 As the 1960s began, McNeil’s painterly gestures started to gesture back at him, persuading him to let patterns of color turn into images of anatomies. 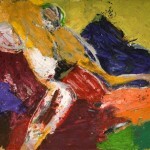 Or that is one way to understand the step-by-step appearance of the figures that inhabited his paintings from the mid-’60s onward. The wild distortions of their bodies and faces prompted critics to compare him to Jean Dubuffet, founding father of art brut—“raw art” designed to challenge good taste and decorous feeling. The comparison is not entirely wrong, and yet McNeil never meant his paintings as confrontation with propriety. Nor do his figures display those unconsciously tasteful, even prim details that Dubuffet, despite his stated intentions, could not keep out of his art. For McNeil, there is no question of taste or tastelessness. The force of his feelings brushes all such considerations aside. Walking around a canvas, building a structure from blocks and streaks of color, he would see the possibility of a figurative image. The difficulty then was to hold back, maintaining the integrity of his “plastic expression” while encouraging the figure to emerge. To go too fast was to run the risk of sacrificing the complexities of his forms to the simplicities of illustration. To succeed was to charge those formal complexities with psychological meaning. When that happens, said McNeil, “It’s like meeting somebody.” We might well wonder who it is we meet in his later paintings, with their astonishing population of grinning, babbling, gesticulating people. It is difficult for the eye to disentangle some of them from the surging, splashing pigments that serve as their environments. Others jump out at us, unleashed by a complete lack of inhibition. 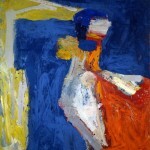 It is always plausible to say that a painter’s figures are self-portraits. Yet it makes just as much sense to say that McNeil gives us images of an Everyman—and Woman—adapting at high speed to the slings and arrows directed their way by the world around them. As our world and its challenges morph, so do they. 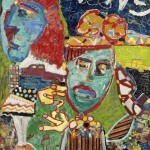 During the 1980s, the heyday of Neo-Expressionism, the veteran expressionist McNeil responded more to graffiti and punk. Here again we see him standing in two places at once—in the thick of things, where he had been ever since the late 1920s, and off to the side. For graffiti and punk were youthful styles. However passionate inwardly, outwardly they were cool. McNeil was never cool. He was always hot, even molten. In 1965 he said, “I am very concerned with what I think, to use a fancy term, is the existential condition of man.” The still unassimilated surprise is the way he saw that condition—or, rather, felt it and communicated it to us. For McNeil, life could be frantic, it could be desperate, but it could never be grim. And if that desperation originates in the ultimately unbreachable isolation of our separate individualities, this fate can always be redeemed by a heavy tinge of manic joy.